Accueil Bande originale Paroles Chansons Someday – Paroles de la chanson dans “Z-o-m-b-i-e-s”. Someday – Paroles de la chanson dans “Z-o-m-b-i-e-s”. Paroles : Dustin Burnett et Paula Winger. 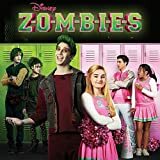 Interprétée par Milo Manheim et Meg Donnelly. I know this might be crazy but. did you hear the story. I think I heard it vaguely. A girl and a zombie. I got a feeling if you get know me. What could go so wrong with. You’re from the perfect paradise and. I’m living on the darker side. Oh tell me more boy it sounds like a fantasy. Right from the start you caught my eye. Something inside me came to life. I got a feeling if you get to know me. Someday could we be something. You and me side by side. We’re going to be someday. Oh now you’re getting fearless. Oh girl I’m just rooting for us. If different was a super power. Oh we’ll be so flawless. Yeah we can make this whole world ours. I’m just rooting for us. Two lonely hearts within the dark. Imagine now how they start a spark. Movies and long walks in the park. We can hang out anywhere we want. I like the way you thinking. So let them talk if they wanna. Let them talk if they’re gonna. We’re gonna do what we wanna. Let them talk, let them talk if they wanna. We’re going to be someday .